"Best known as a swan winging its way across the night, the constellation Cygnus is easily seen in the northern hemisphere's summertime sky. 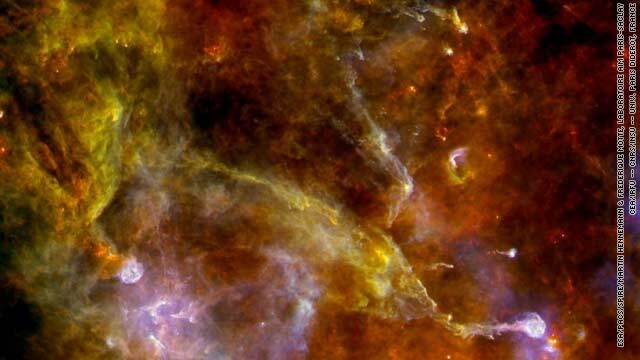 This new view of the Cygnus-X star-forming region by the Herschel Telescope highlights chaotic networks of dust and gas that point to sites of massive star formation. This image combines far-infrared data acquired at 70 micron (corresponding to the blue channel); 160 micron (corresponding to the green channel); and 250 micron (corresponding to the red channel). The observations were made on May 24, 2010, and Dec. 18, 2010. Herschel is a European Space Agency cornerstone mission, with science instruments provided by consortia of European institutes and with important participation by NASA." If you could just sit back // check out the Blown-up pic ' Brain Nutron" and find that the two combined are the same. The very begining of how life??????? ?